The Emmys is one of those awards show where we expect the stars to pull out all the stops and this past Sunday was no exception, but what did surprise us were the amount of fashion risks we saw this year. Celebrities didn’t appear in the same boring ball gowns, we saw some unique looks and even those that tried difficult styles made it work (we’re looking at you Kerry Washington). Ok, not everyone made it work, there were a few misses in there, but we loved the looks on the whole. 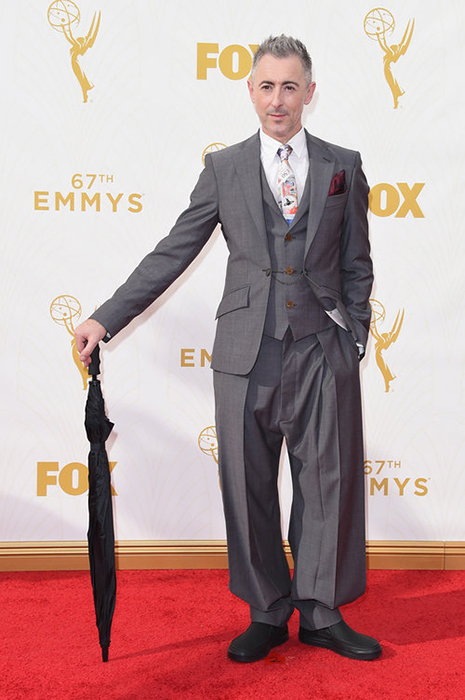 Take a look at our top picks for best and worst dressed at the Emmys. Rosemary’s Pick: Kerry Washington looked absolutely stunning in a mixed metal mid length Marc Jacobs dress. The dress, which debuted just days before the Emmys at New York Fashion Week, had a lot going on but was paired perfectly with subtle jewelry and shoes. Kerry wore her hair up in a trendy faux bob to show off the dress’ unique shoulder embellishment. The mesh paneling, the studs, the silver and gold, everything about this dress came together perfectly for an edgy, fresh look. Frances’ Pick: Sarah Hyland seems to be on her way to becoming a style icon. We recently put her on our best dressed list for the Teen Choice Awards and here she is looking stunning again. Normally her outfits are more on the cutesy side, but Hyland looked sleek and sophisticated in a burgundy Zac Posen dress. The form fitting column gown, gave her a nice womanly look and the matching Lorraine Schwartz and Ofira ruby accessories complemented the ensemble perfectly. The rear view, with its backless neckline detail made for amazing over the shoulder shots on the red carpet. Loved it!